First manned flight to lunar orbit. Speed (10,807 m/s) and altitude (378,504 km) records. Mission resulted from audacious decision to send crew around moon to beat Soviets on only second manned Apollo CSM mission and third Saturn V launch. Launched: 1968-12-21. Returned: 1968-12-27. Number crew: 3 . Duration: 6.13 days. Location: Museum of Science and Industry, Chicago, IL. As soon as Borman's crew learned, on 10 August, that it might fly a lunar mission, the men began to train for the moon flight. On 9 September, sessions on the Cape simulator began. Six weeks before launch, these turned into day-after-day, ten-hour work periods. With the help of the support team - Mattingly, Carr, and Brand, who followed the hardware, coordinated the preparation of checklists, and worked out spacecraft stowage - the crew was ready on time. Shortly after 2:30 on the morning of 21 December, Borman, Lovell, and Anders rose and dressed for the launch day breakfast with, among others, George Low, the man who had hatched this scheme to send them into lunar orbit on Apollo's second manned flight. Many guests were in Florida for the send-off, thousands more than the crew had formally invited. In the chilly predawn, the visitors clogged the roads, their headlights flashing, searching for the best vantage points. Busloads of newsmen trundled through the gates, heading for the press area, and helicopter-borne groups of VIPs landed near the special viewing stand. All attention focused on Apollo 8, bathed in the glare of spotlights that made it visible for many kilometers. Radio announcers, television commentators, and public address spokesmen told millions around the world and the thousands in the Cape area that soon three astronauts would leave this globe to visit another. 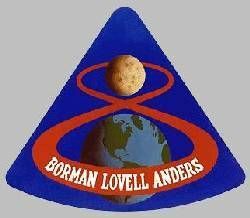 At 7:51, Borman, Lovell, and Anders, lying in their couches 100 meters above the launch pad, started on that journey. Riding the huge Saturn V, propelled by more power than man had ever felt pushing him before (33.4 million newtons, or 7.5 million pounds of thrust), the crew had varied impressions. Borman thought it was a lot like riding the Gemini Titan II. Lovell agreed but added that it seemed to slow down after it left the pad. Rookie astronaut Anders likened it to "an old freight train going down a bad track." The S-IC stage shook the crew up, but not intolerably. Despite all the power, the acceleration reached only four g. At engine cutoff, it dropped to one g. During S-II stage acceleration, pogo stayed within allowable limits and caused no pain to the pilots. They were glad, however, when the engines cut off and the second stage fell away. A dozen minutes after launch, the S-IVB third stage had already fired to drive itself and the spacecraft into earth-orbital flight. Borman, Lovell, Anders, and the flight controllers checked the spacecraft and third stage systems for a revolution and a half, in preparation for the next step in the mission. At 10:17, former crew member Collins - back from his bout with the bone spur and now at the capcom's console rather than in the center couch of Apollo 8 - opened a new era in space flight when he said, "All right, you are go for TLI [translunar injection]." Many watchers in Hawaii, who had seen a launch on live television for the first time, raced outside and looked for the fireworks high above them. "Psychologically it was a far easier flight than Gemini 7. You adopt a philosophical approach after you burn TLI, and I wasn't really concerned about anything. When you are in earth orbit you are always aware that if something happens you have to react quickly to get down. Once you burn TLI, . . . you really are not concerned with reacting swiftly because it is going to take you [at least] two or three days to get home anyway. " 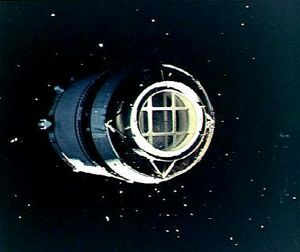 The command and service modules separated from the S-IVB and flipped around so the crew could photograph the adapter, where the lunar module would be housed on future voyages. Borman commented that formation flying was no more difficult with the S-IVB than it had been with the Gemini Agena and that docking with the LM should pose no problems. Since they had no lander on this mission, they chose not to get too close to the S-IVB. The crew used the small reaction control engines on the service module to begin a separation maneuver with a velocity change of less than a meter per second. But Borman soon noted that the S-IVB was getting closer, instead of moving away. Both the crew and the flight controllers were puzzled. Communications crackled back and forth. Kraft and Bill Tindall talked with Carl R. Huss, who was manning the mission planning and analysis desk in the flight support area, demanding to know what to do. Huss held them off until his group had time to figure out that the crew had not made its maneuver exactly as it should. Studying the relative positions of the two vehicles, Huss soon gave the controllers new information to radio to the space ship. The crew fired the small engines again - this time for a change of two meters per second, changing the trajectory and moving away from the too - friendly third stage. Early in the flight, the crew was captivated by the view of the earth from space, especially the detail revealed at a single glance. Borman commented, "We see the earth now, almost as a disk." Then he asked Collins to "tell Conrad he lost his record." Conrad and Gordon had been the highflight champions of Gemini. Lovell, looking through the center window, began to call out place names as if he were an announcer in a railway terminal: Florida, Cuba, Gibraltar, Africa (East and West), Central America, and South America. Borman suggested that Collins warn "the people in Tierra del Fuego to put on their rain coats; looks like a storm . . . out there." A safe distance away from the S-IVB, the three crewmen left their couches to take off their pressure suits and met with a surprise - motion sickness. Rapid body movements brought on nausea. Borman suffered the most. There had been a rash of gastroenteritis cases at the Cape just before launch. This "24-hour intestinal flu" might have caused Borman's illness, but there was another possibility. Because it had taken longer to get away from the S-IVB than had been planned, he was late getting to his rest period. To make sure he went to sleep quickly, he had taken a Seconal tablet. During preflight testing of the medical supplies Borman had a slight reaction to this sleep-inducing pill, so he blamed the medication for at least part of his distress. When he awakened, after very fitful rest, Borman retched and vomited twice and had a loose bowel movement. The waste management system worked, but just barely. The crew reported their problems to the flight surgeon and, as Collins said later in Carrying the Fire, "the first humans to leave the cradle had called for their paediatrician." Next day, however, Borman happily told flight control, "Nobody is sick." "we never really saw the moon. It was a crescent moon, and most of it was dark. I saw it several times in the optics as I was doing some sightings. By and large the body that we were rendezvousing with, that was coming from one direction as we were going to another, we never saw. And we took it on faith that the moon would be there, which says quite a bit for Ground Control." At a distance of 223,000 kilometers from the earth, 31 hours after leaving home and 40 before reaching the moon, the crew put on its first television show. Scenes showed the inside of the craft, with Borman as director and narrator, Lovell as actor (preparing a meal , and all three crewmen as Cameramen. Anders installed a telephoto lens to get a better view of the earth, but the lens did not work. When the crew switched back to the interior lens, the earth looked like a white blob. Lovell pointed out that the earth was very bright and they were using a low-level lens. Borman added that the camera was pointing through a hazy window. He was disappointed that they could not show their viewers the "beautiful, beautiful view, with [a predominantly] blue background and just huge covers of white clouds." "Frank, what I keep imagining is if I am some lonely traveler from another planet what I would think about the earth at this altitude, whether I think it would be inhabited or not. . . . I was just curious if I would land on the blue or brown part of the earth. " Anders interjected, "You better hope that we land on the blue part." Following the second video presentation, the crew neared a new stage in manned space flight - travel to a place where the pull of earth's gravity was less than that of another body. At 3:29 in the afternoon on Monday, 23 December, that historic crossing was made. At that point, the spacecraft was 326,400 kilometers from the earth and 62,600 from the moon, and its velocity had slowed to 1,218 meters per second. Gradually, as the ship moved farther into the moon's gravitational field, it picked up speed. Now the crew prepared for another event - again denoted by one of the abbreviations with which space flight jargon abounds, LOI (lunar-orbit insertion). Since the craft was on a free-return trajectory - a path shaped like a figure eight that would loop the ship around the back of the moon and return it to the earth - Borman wanted "a perfect spacecraft before we can consider the LOI burn." He would hate to leave that good trajectory and then find out that something was wrong. So far, the big service module engine had worked perfectly every time, but the path to the moon had been so precise that only two of four planned midcourse firings had been necessary. Ground control assured him that everything was in order. At 68 hours 4 minutes into the mission Carr, at the console, told the crew, "You are go for LOI." He also informed the astronauts that the closest point of their approach should be 119 kilometers above the moon. 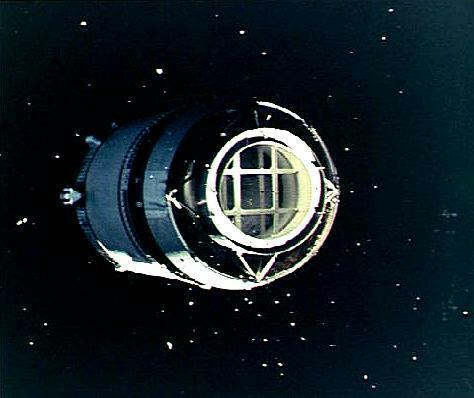 Minutes before this transmission, when Borman commented that they still had not seen the moon, Carr asked what they could see. Anders replied, "Nothing. It's like being on the inside of a submarine." During Mercury, Gemini, and Apollo orbital missions, there had been periods of communications silence, especially in the southern hemisphere, because the worldwide tracking network did not cover all areas. Up till now Borman and his crew had been in continuous contact during the translunar voyage, but no communications would be possible when the spacecraft went behind the moon. 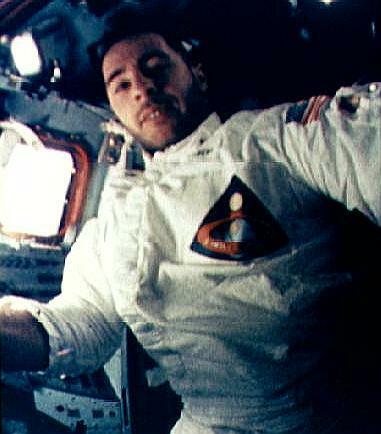 Just before loss of signal in the early hours of 24 December (at 4:49), Carr wished them a safe journey, and Lovell answered, "We'll see you on the other side." Eleven minutes later, traveling at 2,600 meters per second with their heads down so they could watch the lunar landscape, they fired the service module engine for four minutes to reduce their speed by 915 meters per second and get into an orbit approximately 111 by 312 kilometers. Although the engine performed flawlessly, Lovell called it the "longest four minutes I ever spent." While the engine was firing, Lovell and Anders exclaimed about their fantastic view of the moon. Anders added that he had trouble telling the holes from the bumps. Borman called them back to watch their dials. Borman, Lovell, and Anders knew that the engine had fired successfully, but nearly a billion persons in 64 countries (according to TV Guide ) did not. If the spacecraft had not gone into orbit, it would come back into communications range 10 minutes earlier than planned. After what seemed an interminable wait, Paul Haney, on the public information console in flight control, gleefully announced, "We got it! We've got it! Apollo 8 now in lunar orbit." "Okay, Houston, The moon is essentially gray, no color; looks like plaster of Paris or sort of a grayish deep sand. We can see quite a bit of detail. The Sea of Fertility doesn't stand out as well here as it does back on earth. There's not as much contrast between that and the surrounding craters. The craters are all rounded off. There's quite a few of them; some of them are newer. Many of them . . . - especially the round ones - look like hits by meteorites or projectiles of some sort. " 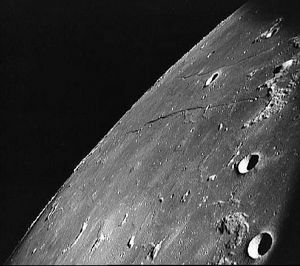 "the Lunar Orbiter photographs which we had on board were quite adequate. There was no problem at all in determining objects particularly on the near side of the moon. There are suitable landing-sites. They are very easily distinguished. We could pick them up. We could work our way in. . . . The Lunar Orbiter photos again were helpful . . . to check the craters on the back side.) "
"It certainly looks like we're picking the more interesting places on the moon to land in. The backside looks like a sand pile my kids have been playing in for a long time. It's all beat up, no definition. Just a lot of bumps and holes. " As Apollo 8 whirled around the moon on its ten two-hour circuits, the spacecraft location display seemed odd at first to those watching the map in mission control. In earth orbit, spacecraft had always gone from left to right on the display panels; on the lunar charts, however, this vehicle moved from right to left. And while it traveled the crew continued to talk about the view. Anders expressed the general opinion that the moon was an "unappetizing looking place"; nevertheless, it did have a kind of stark beauty. Astronauts commented on the hues of light and dark caused by earthshine and sunshine. 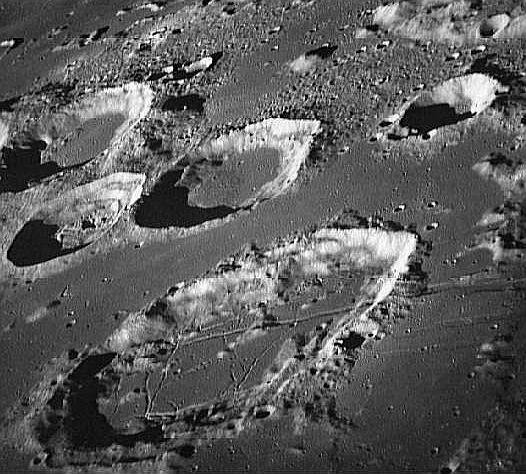 They gave temporary names to some of the craters: names like (Harrison) Schmitt, (George) Low, (Robert) Gilruth, (Joseph) Shea, (Theodore) Freeman, (Gus) Grissom, (Ed) White, (James) Webb, (Thomas) Paine, (Elliot) See, (Alan) Shepard, (Donald) Slayton, (Samuel) Phillips, (Christopher) Kraft, (Roger) Chaffee, (Charles) Bassett, and (Gerald) Carr. Once, when flight controller John W. Aaron was the only one to notice in the general excitement that the environmental system needed an adjustment, Crater Aaron was named on the spot. "Give us, O God, the vision which can see thy love in the world in spite of human failure. "Give us the faith to trust thy goodness in spite of our ignorance and weakness. "Give us the knowledge that we may continue to pray with understanding hearts. And show us what each one of us can do to set forward the coming of the day of universal peace. Amen. " The crew members had consulted other friends about a possible theme for their mission, something to signify one world, something to tell everyone on earth. One suggestion was that they read the story of the Creation in the first 10 verses of the Book of Genesis in the Bible. This they did, during the ninth revolution, closing with "Good night, good luck, a Merry Christmas and God bless all of you - all of you on the good earth." Borman later admitted that he and his crew had not really wanted to carry a television camera; fortunately the decision had not been left to them. Television from the moon had a wide audience. During the flight the crew was told that its shows were being seen all over Europe, even in Moscow and East Berlin; in Japan; in North, Central, and South America; and perhaps in Africa. Lovell, using his optical devices to get a better look, described what was being photographed. Anders raced from window to window for the best vantage points for photographing the lunar surface, especially the areas being considered for landing sites. By the seventh revolution, both of them were so tired that Borman put a stop to the observations. Soon, he knew, they had to start thinking about transearth injection (TEI, another of those important abbreviations) - entrance on the path for homes. On the tenth lap of the moon, on Christmas morning, 3 days, 17 hours, and 17 seconds after earth launch, the service module engine fired to increase their speed by 1,070 meters per second. Rounding the corner from the back of the moon, Lovell told Mattingly, who had taken over as CapCom for that shift, "Please be informed there is a Santa Claus." In mission control, the holiday became a truly festive occasion. A Christmas tree was placed below the flight status board, which again showed an earth map with red and green lights, the traditional colors of the season. Schmitt, who had coached the crew for its geological observations, read a parody on Clement C. Moore's poem, "T'was the Night before Christmas." After leaving the moon, the crew was worn out. The astronauts rested, letting "Isaac Newton" do most of the driving. Following their naps, CapCom Carr gave them the latest earth news, with emphasis on the impact their voyage had made on the world. On the whole, Apollo 8's explorations in December 1968 were acclaimed enthusiastically by the multitudes who looked at their world for the first time from thousands of kilometers in space and at their moon from slightly more than a hundred. The trip back to the earth was uneventful. During the entire trip, CSM-103 registered only such expected irregularities as fogging windows, puddling water, and clattering cabin fans. Now the space-weary travelers could rest, eat, sleep, show television, and enjoy the ride home. Lovell continued his navigational sightings, and flight control did the tracking. Neither could find more than a minor error in the course hours before the scheduled splashdown in the Pacific; one correction (of less than two meters per second) was made. Early Saturday morning, 14,500 kilometers above the earth, the crew fired the pyrotechnics to separate the command module from the service module, which had worked perfectly whenever it was needed. Fifteen minutes later, the spacecraft crossed into the fringes of the atmosphere, 120 kilometers above the earth. Borman told Mattingly they had a real fireball but were in good shape. Spacecraft speed increased to 9,700 meters per second, subjecting the crew to a load of nearly seven g.
"Jerry, I've done a lot of joking about the spacecraft hitting the aircraft carrier, but the more I think about it the less I feel it is a joke. There are reports that the C Prime command module came down right over the aircraft carrier [stationed at 165 degrees 02.1' west longitude and 8 degrees 09.3' north latitude] and drifted on its chutes to land [at 165degrees 1.02' west and 8 degrees 07.5' north, only 4,572 meters] away. This really strikes me as being too close. . . . The consequence of the spacecraft hitting the carrier is truly catastrophic. . . . I seriously recommend relocating the recovery force at least [8 to 16 kilometers] from the target point. " The craft came down in darkness on Friday, 27 December (6 days, 3 hours, and 42 seconds after launch), flipping over on its nose as it landed. Until Borman punched the button that inflated the air bags to upright the spacecraft, its flashing light beacon was lost to the sight of the recovery helicopters. Mission ground rules required a daylight recovery, so Borman and his crew waited 45 minutes for the swimmers to open the hatches. A few minutes later, the helicopter deposited the crew on the deck of the U.S.S. Yorktown for the last lap of - in Borman's words - "a most fantastic voyage." Family: Manned spaceflight. People: Anders, Borman, Lovell. Country: USA. Spacecraft: Apollo CSM. Projects: Apollo. Launch Sites: Cape Canaveral. Agency: NASA Houston. 1966 January 13-20 - . Apollo AS-503 to reduce LEM crewed altitudes - . Nation: USA. Program: Apollo. Flight: Apollo 8. Spacecraft: Apollo LM, LM Crew Station. Mission requirements for AS-503 were reviewed to determine if the LEM test objectives which caused the crew to be in the LEM at high altitudes (3,704 to 12,964 km (2,000 to 7,000 nm)) could be deleted. The reason for keeping the crew out of the LEM at those altitudes was the possibility they might be exposed to a total radiation dose which might prevent them from flying a later lunar mission. Three additional backup Apollo missions studied - . Nation: USA. Related Persons: Kraft. Program: Apollo. Flight: Apollo 8. 1966 December 5 - . Launch Vehicle: Saturn V.
1966 December 26 - . Extravehicular activity on the Apollo AS-503 mission - . Nation: USA. Program: Apollo. Flight: Apollo 8. Spacecraft: Apollo LM, LM Descent Propulsion, LM ECS, LM Hatch, LM Landing Gear, LM RCS. 1967 November 15 - . Launch Vehicle: Saturn V.
Payloads for Apollo AS-503 - . Nation: USA. Program: Apollo. Flight: Apollo 8. Spacecraft: Apollo LM. 1967 December 1 - . Launch Vehicle: Saturn V.
Plans resulting from Apollo 4 mission - . Nation: USA. Program: Apollo. Flight: Apollo 8. CSM 020 would be flown on the Apollo 6 mission. Boilerplate 30 was assigned to the AS-503 unmanned mission. If Apollo 6 was successful, AS-503 would be flown as the first Saturn V manned mission. 1968 January 18 - . 1968 January 26 - . 1968 April 12 - . 1968 August 12 - . Launch Vehicle: Saturn V.
Apollo 8 lunar mission scheduled for December 20. - . Nation: USA. Related Persons: Low, George. Program: Apollo. Flight: Apollo 8. Spacecraft: Apollo CSM, Apollo LTA. 1968 August 26 - . Launch Vehicle: Saturn V.
Payload weight of 39.78 tonnes for Apollo AS-503 - . Nation: USA. Program: Apollo. Flight: Apollo 8. Spacecraft: Apollo LM, LM Weight. 1968 August 27 - . Launch Vehicle: Saturn V.
Decision to use Apollo LTA-B as payload ballast on the AS-503 flight - . Nation: USA. Related Persons: Low, George. Program: Apollo. Flight: Apollo 8. Spacecraft: Apollo LTA, LM Weight. 1968 September 3 - . Apollo 8 launch readiness date changed to December 13, 1968 - . Nation: USA. Program: Apollo. Flight: Apollo 8. Apollo Program Director Samuel C. Phillips notified the three manned space flight Centers that the Apollo 8 launch readiness working-schedule date had been changed to December 13, 1968..
1968 September 10-11 - . Launch Vehicle: Saturn V.
1968 October 7 - . Soviets consider Apollo 8 has no chance of success - . Nation: Russia. Related Persons: Tyulin. Program: Apollo, Lunar L1. Flight: Apollo 8. Tyulin is still complaining that the VVS never signed the L1 design specification. But the crews are ready for flight. The flight of Apollo 8 to the moon is announced. Kamanin considers this an adventure with no chance of success. After all, there have been only two Saturn V launches, the last one a partial failure. The US has never flown a crew to escape velocity or lunar distance. The whole thing is a risky, unsafe adventure. 1968 October 7 - . 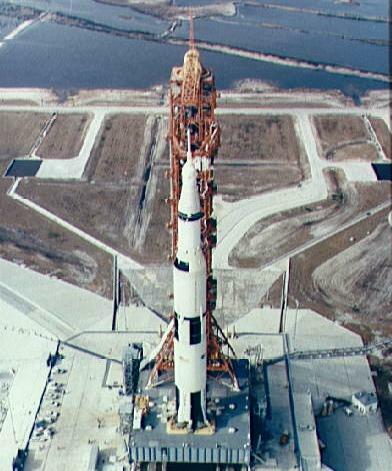 Launch Vehicle: Saturn V.
Apollo 8 CSM installed atop the Saturn V - . Nation: USA. Program: Apollo. Flight: Apollo 8. Spacecraft: Apollo CSM, CSM Block II. In preparation for the flight of Apollo 8, NASA and industry technicians at KSC placed CSM 103 atop the Saturn V launch vehicle. The launch escape system was installed the following day; and on October 9 the complete AS-503 space vehicle was rolled out of the Vehicle Assembly Building and moved to the launch pad, where launch preparations were resumed. 1968 October 10 - . 1968 October 24 - . Launch Vehicle: Saturn V.
1968 November 11 - . Launch Vehicle: Saturn V.
Paine gives Apollo 8 go-ahead for lunar orbit mission. - . Nation: USA. Related Persons: Low, George, Paine. Program: Apollo. Flight: Apollo 8. Spacecraft: Apollo CSM, Apollo LTA. Low's initiative had paid off; the final decision to go to the moon in 1968 was made with the blessings of all of NASA's decision-makers, the Apollo Executive Committee, STAC, and PSAC..
Public announcement of decision to send Apollo 8 to lunar orbit. - . Nation: USA. Related Persons: Low, George, Paine. Program: Apollo. Flight: Apollo 8. 1968 December 9 - . Launch Vehicle: Saturn V.
1968 December 19 - . 1968 December 22 - . Soviet reaction to Apollo 8 - . Nation: Russia. Related Persons: Khrushchev, Pashkov, Smirnov, Ustinov. Program: Lunar L1, Apollo. Flight: Apollo 8, Voskhod 3. Apollo 8 has been launched. Kamanin recalls that he first saw a model of the Saturn V during his visit to Washington DC with Titov in 1962. At that time the Soviet Union planned to fly the N1 in four years, but the only manned spacecraft on the drawing boards after Voskhod was the Sever. Khrushchev didn't give a go-ahead for the lunar program until 1964. In the gap between Voskhod and Soyuz flights, when the American Gemini program seized the lead, the USSR could have achieved a record by flying Volynov for 18 days in Voskhod 3. But this was cancelled at the last minute by the leadership because the Voskhod had 'no development potential'. Ustinov, Smirnov, Pashkov were responsible for this decision, which put the USSR permanently behind in the space race. Apollo 8 and L1 plans - . Nation: Russia. Related Persons: Mishin. Program: Lunar L1. Flight: Apollo 8. Spacecraft Bus: Soyuz. Spacecraft: Soyuz 7K-L1. 1968 December 28 - . Soviet space cadres stand down after Apollo 8 success - . Nation: Russia. Program: Apollo, Lunar L1. Flight: Apollo 8. Two to three days rest for the demoralised cadres is declared, before renewing anew the assault on the cosmos in January. Kamanin muses that some day Communism will be on all of the planets of the solar system, and men will travel in fully automated spacecraft. But full automation is the wrong approach now. 1969 February 8 - .